This is a strip-stack quilt top + border + binding I worked out to use up one *entire* jelly roll (forty 2.5″ fabric strips, each about 43-44″ long). 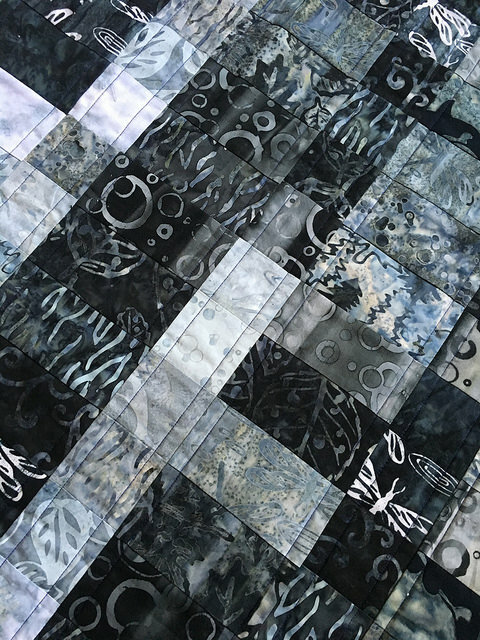 Because it uses pretty much every inch of every strip, you really do have to use the wonky center bits of the strips — if you’re a perfectionistic quilter, this is not a design you will enjoy. 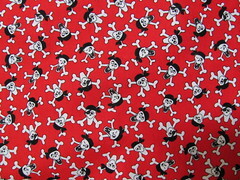 All seams are a scant 1/4″ and are sewn right sides together. There are fifteen 12-inch blocks (finished dimensions) in a 3×5 pattern. Each block has two rows of 4-inch pieces (finished dimensions) alternating with two rows of 2-inch pieces (finished dimensions). 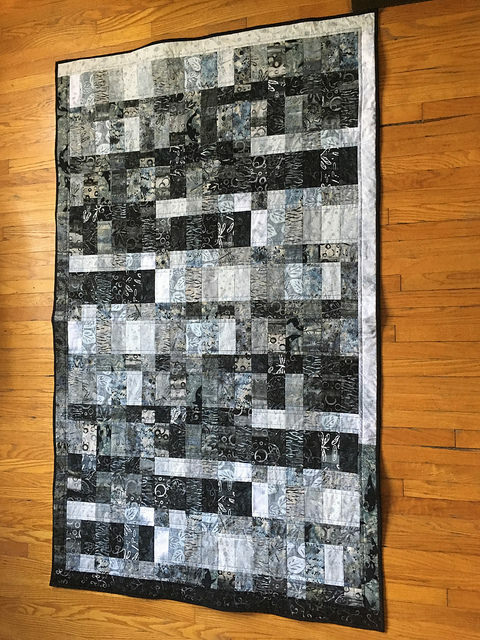 With the border and binding, the quilt finishes at about 40″ x 64″. There are five strip sets made from jelly roll fabric strips. For each of the five strip sets, choose six fabric strips from the jelly roll and arrange them in an order you find pleasing. Stack them up and mark the topmost strip (I use a loose basting stitch in a bright, contrasting thread colour) of each stack. Number each strip stack with a sticky note or somesuch so you can keep track of which is which for design purposes. I arranged my strip sets from lightest (#1) to darkest (#5) but do whatever works for you. Sew the long edges of the strips in each stack together, starting by joining the topmost fabric in a stack with the second fabric in that stack. Add the 3rd strip to the bottom of the 2nd and so on until the six fabrics in each stack are all sewn together in one big (probably slightly wonky, because the middles of jelly roll strips are usually a bit wonky) piece about 12.5″ x 43-44″. Iron each strip set, pressing all seams toward the TOP of each set (this is important) and getting all the lines as straight as you can. Starch the living heck out of each strip set to keep them from stretching annoyingly while they’re being cut and arranged. From each strip set, cut six 4.5″ pieces AND six 2.5″ pieces. There is not much extra fabric so be careful (resign yourself to some eccentricities in the end product). Whatever design you choose, it’s important to orient the 4.5″ and 2.5″ strips in opposite directions. If you decide your 4.5″ strips will have their top fabrics at left in each block, make sure the 2.5″ strips will have their top fabrics at right (or vice versa). That way the seams will nest when you sew them. 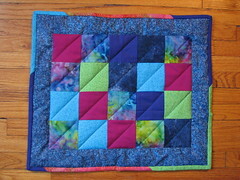 Then go ahead and sew the bits of each block together. Trim the sides — only the sides, leave the tops and bottoms untrimmed for now — of each block to make each as close to 12.5″ wide as you can. Sew the blocks in each row together, lining everything up as best you can. Now you can trim the top & bottom so the whole row is 12.5″ (…ish) high (or at least reasonably straight). Press the seams on the odd-numbered rows OUT towards the edge of the row and the seams on the even-numbered rows IN so they will nest when you sew them together. Sew the rows together, again lining things up as best you can. 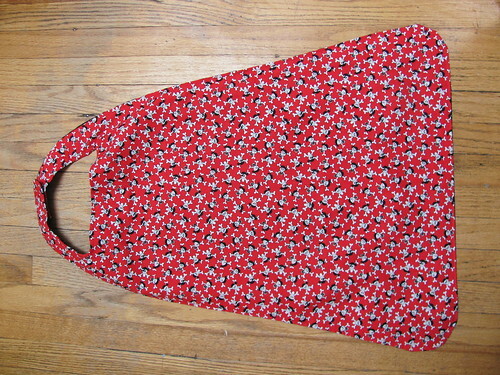 Start matching the seams in the middle of each row and work outward to spread any wonkiness more evenly. Choose five strips from your jelly roll to form the borders. The last one will also end up in your binding, so consider that. Trim the quilt edges to get rid of any bits that stick out. Sew the short ends of your chosen fabrics together to form a very long strip. Starting right at one end of this very long strip sew it, right sides together, to the long edge of one side of your quilt top. Trim off the rest of the long strip then sew it to the other long side. Trim that, and sew it to one of the short edges. 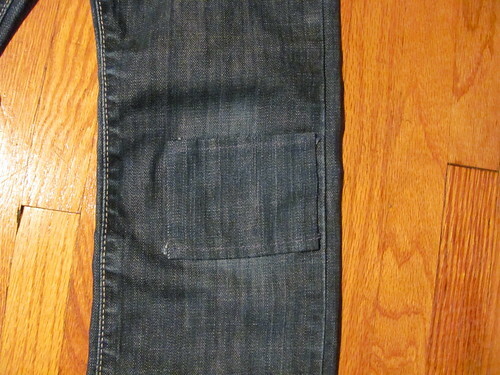 Trim, then sew it to the last short edge. Keep the remaining piece for the binding. (This is more annoying than using whole strips for the short edges, but leaves the longest possible leftover piece for the binding.) 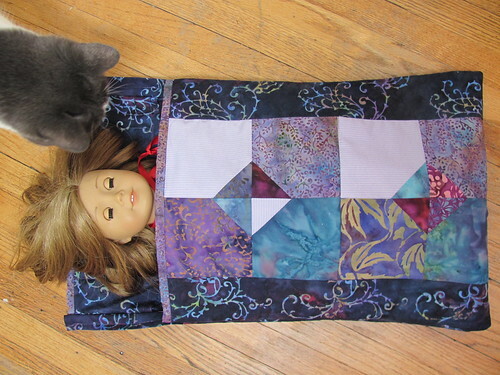 Press your seams to the inside of the quilt. You will have about 5.5 strips left for binding, which is distressingly not a lot more than what you truly need (I always like to have extra). Cross your fingers and make your binding in the usual way. That’s the end of the jelly roll part! 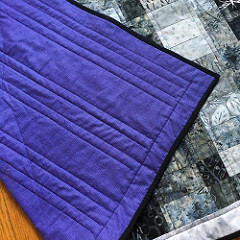 Make your quilt sandwich, quilt & bind using your preferred method. 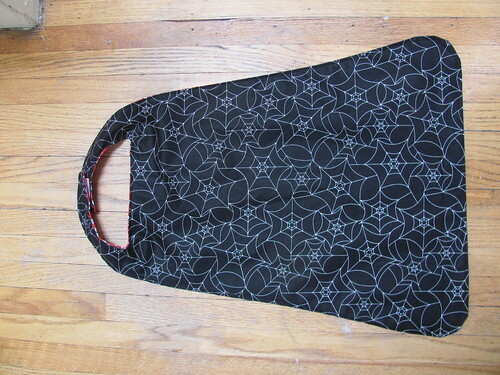 The back is narrow enough that you can use a length of normal-width fabric for backing. After working out all the calculations, I cheated and subbed three-and-a-half black strips in addition to the two that were in my jelly roll for the binding in place of three-and-a-half patterned strips. 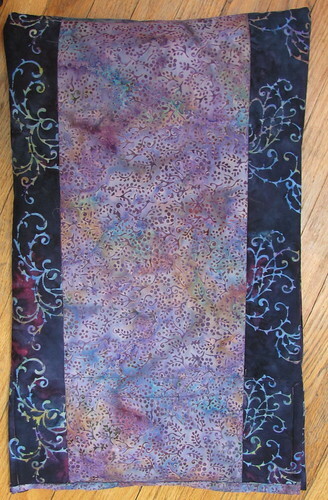 Since I was putting a purple print on the back the varied colours in the jelly roll just looked too busy. I’m sure those three-and-a-half displaced strips will end up binding something else eventually. I quilted straight lines on either side of each horizontal seam, then ran a final line around the border at a similar distance from the seam. 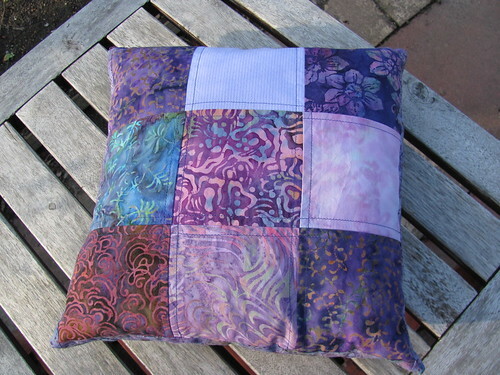 All the quilting is in dark purple cotton thread. 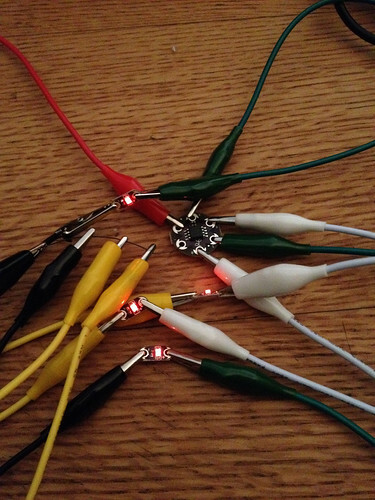 I’m experimenting with wearable computing as a way to get back into programming. It’s fun because it involves more than just pixels on a screen; you get to mess with real-world stuff like LEDs and circuits and sensors and whatnot. And it’s low-risk because it’s hard to shock yourself badly or make stuff blow up when you’re working with 3 to 5 volts. Eventually I’m planning to make a turn-signal jacket for biking, much like this one, but I wanted to get a sense of how to work with the various necessary bits — sewable processors, LEDs, conductive thread and so on — before adding programming to the mix. 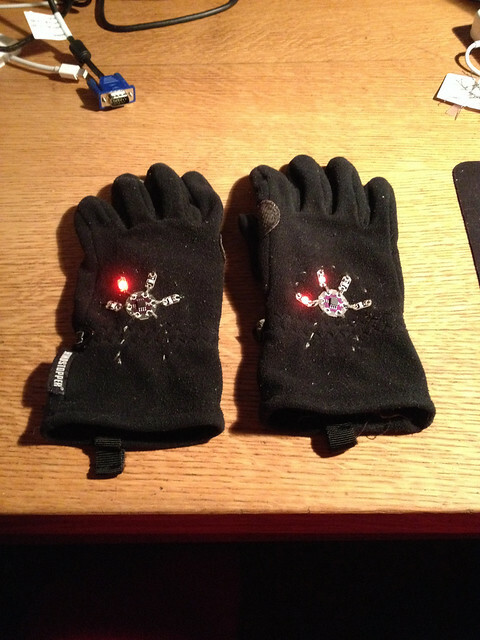 I thought I’d start by just adding some uncomplicated LEDs to the back of some gloves so that when I stick out my arms to signal a turn there’s a little bit of extra light there to make it yet more obvious what I am doing. 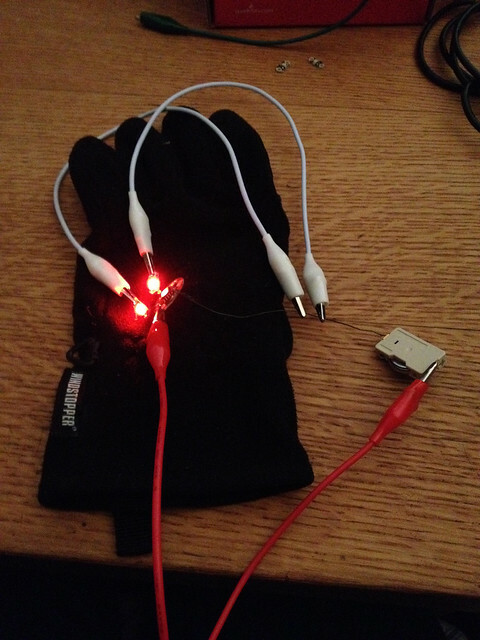 I was going to just sew some LEDs to my gloves, using the conductive thread as a resistor and connecting them directly to a battery holder for power (so the LEDs would be on whenever the battery was in). 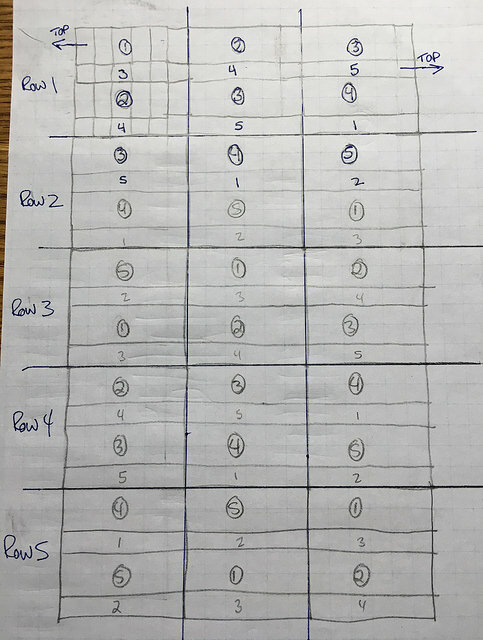 This is a good enough plan, but then I found tiny boards pre-programmed to light up 4 LEDs in random blink/fade patterns and I liked the idea of that better. 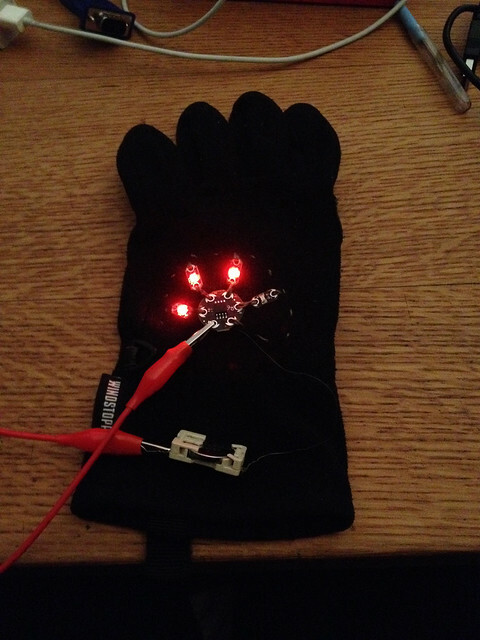 So I bought two Lilypad twinkle boards and a bunch of sewable LEDs (normal LEDs are also sewable of course, but not so much washable which for gloves is definitely a factor) and some stainless-steel thread. I wanted LEDs in a colour other than red or white (which have legal meanings for bike lights) but only red and white were available. I used red, then, so they look like taillights and not headlights, which I thought might be confusing for people behind me. Here’s a picture of the circuit concept. There are 4 LEDs, each with their positive end connected to a petal on the board (the white and green clips) and their negative end connected to a wire connected to the negative port on the board (the yellow and black clips). The wire then connects to the negative end of a battery. The red clip connects the positive port on the board to the positive end of a battery (not shown). When the circuit is closed, the LEDs blink and fade in random patterns. Since the proof-of-concept worked I started sewing, connecting the LEDs each to one of the four ports on the board by sewing a very short seam with stainless-steel thread. It’s terrible stuff to work with; very high friction, very sharp, very prone to tossing off tiny thread fragments that short out your circuits, very hard to seam-rip. After my first experiments with it I started to wrap several of my fingers in first-aid tape to protect them. You can use stainless-steel thread in a sewing machine as a bobbin thread, which is probably a less personally damaging idea but not one that would really have worked with gloves. I tested each seam after I finished it to be sure it worked. After all four LEDs were attached to the glove and the board, I ran a long seam from the negative port on the board to each of the negative ends of the LEDs, testing each one as I went. Once that was all working it was time to attach the battery and sew the seam from the positive and negative ports to the battery case. 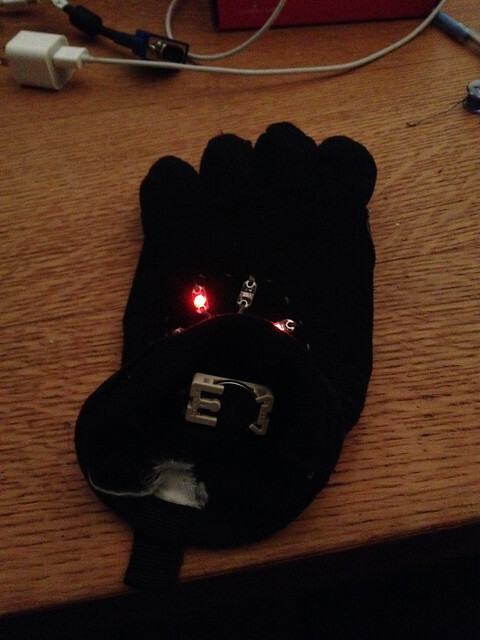 I put the batteries on the inside of the gloves to shield them from the weather somewhat. They work! The patterns are mildly mesmerizing so I don’t look at them while I’m riding. Once I was satisfied that they were working I covered the exposed stitches with black fabric paint to help protect the thread and keep it from throwing off the aforementioned circuit-shorting fragments. – Move the batteries farther away from my wrist. I put them close to the wrist elastic on the gloves to keep them protected and to keep them from getting joggled around too much but I think it would be easier to pull the gloves on and off if they were closer to the far edge of the glove. – Add a switch so I don’t have to pop the battery in and out all the time. This is just a matter of sourcing a suitable switch; they do exist, but not easily through Canadian suppliers. The joys of Canada Customs await. 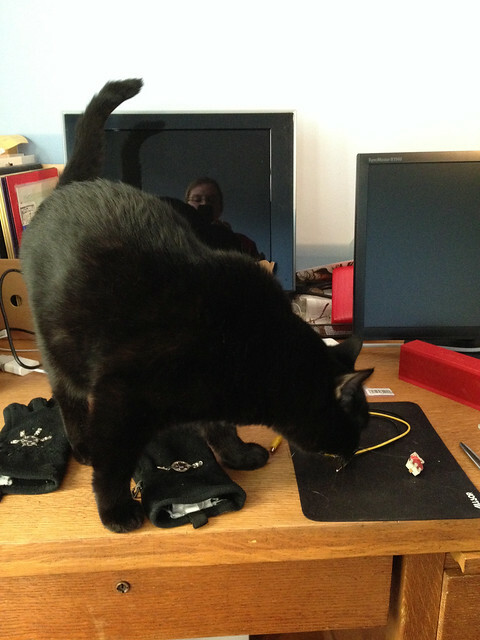 Fortunately I have helpful cats. 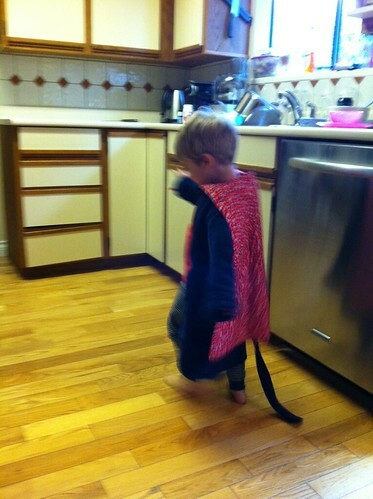 It’s Spiderman! It’s a pirate! It’s both! It’s totally reversible and the neck closure is done with a little bit of velcro so it’s pretty safe (the velcro comes undone easily so it would be hard to strangle yourself). It’s roughly twin-sized – 55″ by 75.5″. I’m quite happy with it, although the back (off-white lightweight polar fleece) isn’t perfect — sewing fleece is an occult art, I fear, and even the walking foot on the machine wasn’t quite up to the task — and the binding is a little odd in spots as it was my first attempt to finish it on the machine. Still, I much preferred using the machine to do the binding. I started off finishing it by hand but it looked terrible given the fleece backing and the high contrast between the off-white fleece and the purple binding, so I figured if it wasn’t going to be perfect it may as well not bore me for eleventy-billion hours and I tossed it onto the machine. 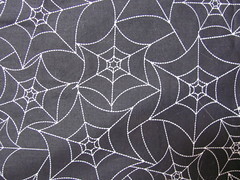 The binding, which doesn’t show up well in the picture, is the same fabric as the inner border. I used Warm and Natural cotton batting, which is warm but relatively thin. With the fleece backing, the quilt is good alone for shoulder seasons. In winter M can toss it over her duvet. I had some small scraps left over, mostly 4.5″ strips, so the quilt spawned two accessory projects. 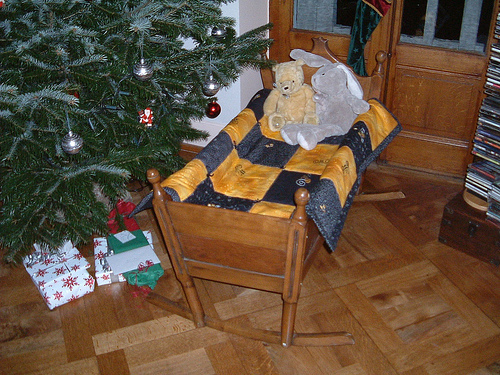 This was a project I mostly did during the sewing class M and I took together in the winter. On my own I wouldn’t have thought to add the extra detail stitching, but I like the effect. The front and back are more-or-less the same, using up 18 4.5″ squares, and there’s a narrow border of the purple binding fabric along the edges (since I also had a bit of binding left over). 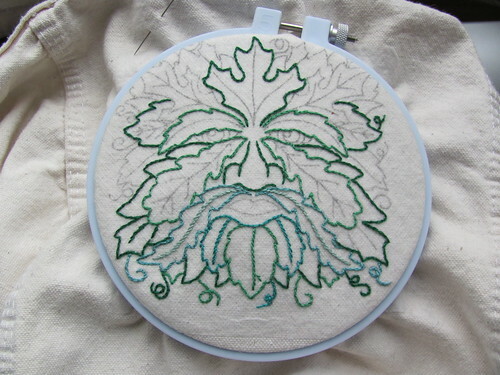 I was testing out a new pattern-transfer paper (Transfer-Eze), which I was hoping would simplify the matter of getting detailed/complex patterns onto the material to be embroidered. 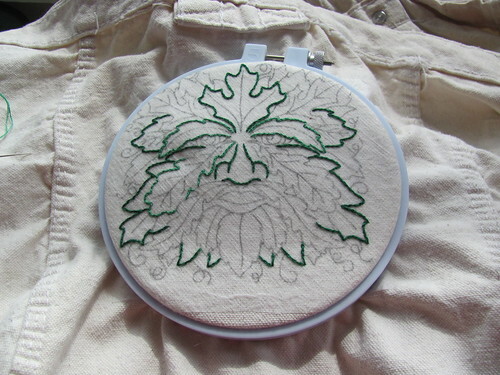 Wax transfer paper, pencils and the like are fine for most things, but I’d been stymied by my Green Man pattern and I thought it would be a good one to use to test the new paper, which promised that I could print right on it and stick it to my work and wash it out afterward. Would my printer work with it? Would the markings stay intact through the whole process? Would the paper wash out properly afterward? Would the project last long enough to distract me from both English and French debates? The happy answer to all these questions is an unqualified Yes, and I can definitely recommend the product. At the beginning. I wanted to see how the transferred lines held up throughout the process. Even halfway through they weren’t deteriorating much, even though I had my fingers all over them all the time and I moved the hoop a half-dozen times. So there we have it. 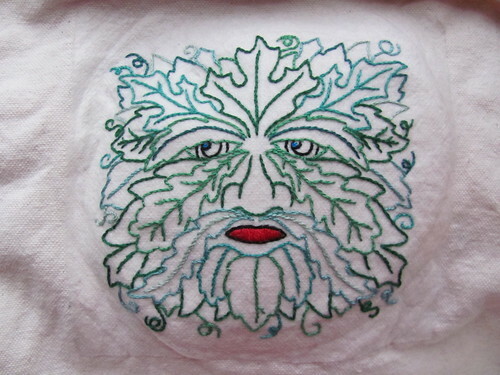 A Green Man. Which, I suppose, is as good a political statement as any about who I might vote for. M is hard on pants. At this point in the year every single pair will have a rip in at least one knee. I never bother fixing them particularly well, since she’ll have outgrown them by the fall anyway, but I do some nominal patching whenever the rips get indecent. She had two pairs of identical jeans, one with massive rips in both knees, one ripped in only one knee. 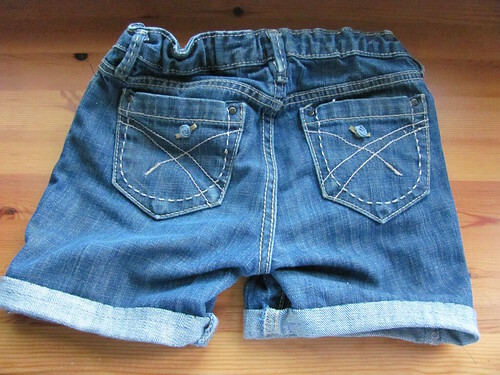 She’s low on shorts and the jeans still fit, so we decided to turn the more-trashed pair into shorts. After pinning them at a good length and cutting them several inches lower, I turned up a hem and stitched it down with the sewing machine. The thread is purple because I was too lazy to reload the machine with navy thread, but oh well, purple is M’s favourite colour right now anyway. Then I turned it up again and tacked it down by hand (grumbling only a bit) and added some little ribbon flower decorations for, as Olivia the pig would say, extra beauty. I’m pleased with how they turned out. My theory is that they may withstand the summer. 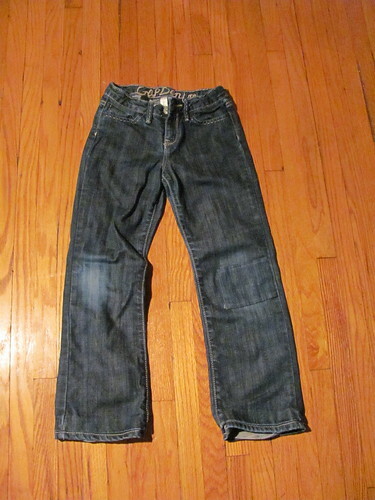 Then I had two jean-legs left over. This is the less-destroyed one. 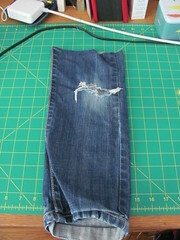 A piece of the more-destroyed leg became a patch for the other pair of jeans. Again with the purple machine-sewed hem and the hand-applique (with more grumbling). 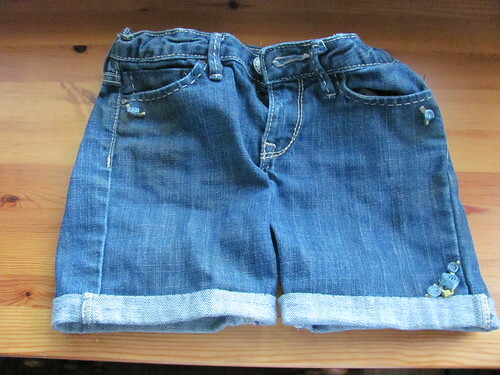 It’s totally noticeable, but they just have to last through the summer — camp, mucking about in barns, etc. — so who cares. 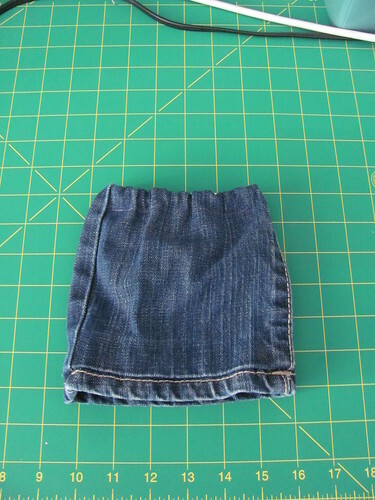 Then (having been called on to sew up a light flanellette skirt for M’s doll that same morning) it occurred to me that the leg of the jeans was probably about the right size for a doll skirt. I cut it off at an approximately suitable length, used the machine to sew a single rough hem and added a bit of elastic. Done! Pretty good for a five-minute project. 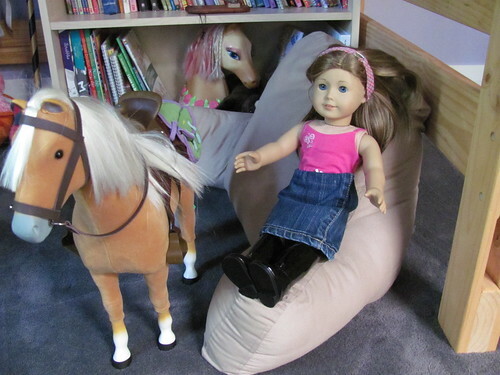 Sadly it’s a little too tight for Ms. Doll to wear while riding her horse, but she can wear it post-ride. And there endeth the jeans. 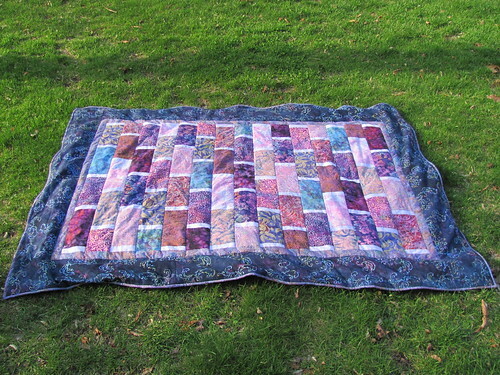 Don’t be too impressed; this quilt is only about the size of a large placemat and it’s made mostly from small scraps pilfered from my mom’s stash. Still, it’s the first one I made all by my lonesome — my previous experience consisted solely of embroidering squares and then handing them over to my mom to do all the hard sewing parts — so I am pleased with myself. M’s doll Alice Rebecca is apparently very pleased with it too. I used the Sew Mama Sew doll quilt sew-along tutorial plus a nice little book Visual Quick Tips Quilting, which had less inspirational but more practical photos of how to do some of the more confusing bits. Even so I totally made up a way of joining the ends of the binding, because all written and photographic instructions were completely cryptic. Maybe next time. 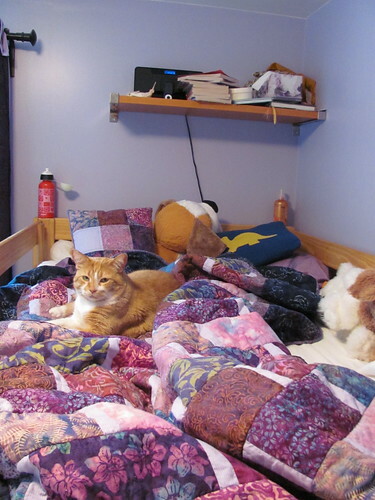 Yay, I can finally mention the quilt! I’ve been dying to talk about the quilt my Mom and I were making for my sister’s soon-to-arrive baby, and since it has reached its destination I can finally speak up. Here it is! I embroidered the 16 squares, most of them with a bee motif and a few with stars. Mom sewed it all together. We had such fun making it — Mom and I both think the other had the bee idea and picked out the fabrics, but whatever, it turned out very nicely. I discovered embroidery is the perfect thing for conference calls at work since it occupies my eyes and hands but not my brain. Otherwise I end up staring at the wall and zoning out, or doing my email and losing track of the call or something equally useless. 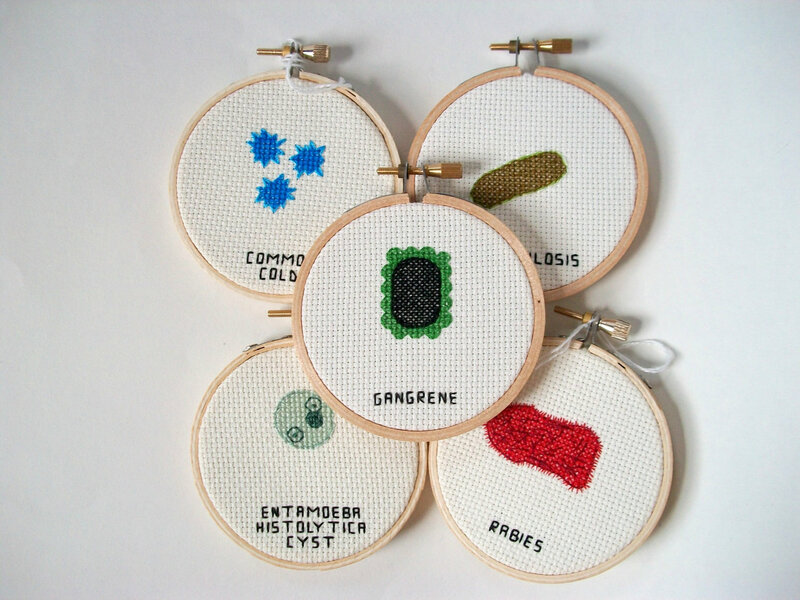 I’ll have to find some small embroidery projects to keep in my office for future calls, since this one is all done! I hope the baby likes it as much as Maddy likes the quilt Mom and my sister made for her when she was born. She still insists on having it tucked around her every night.